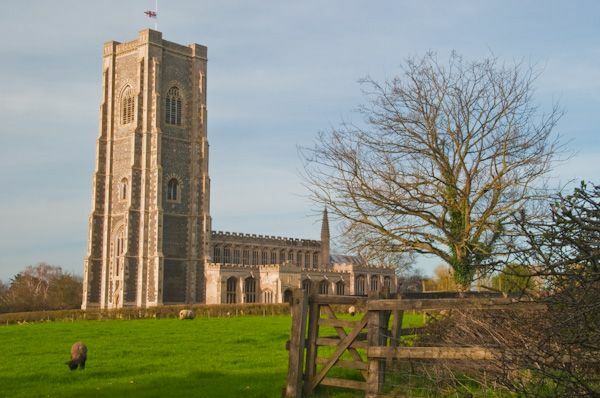 Like other great Suffolk churches of the period, Lavenham was built by local merchants who made their fortunes in the woollen cloth industry. 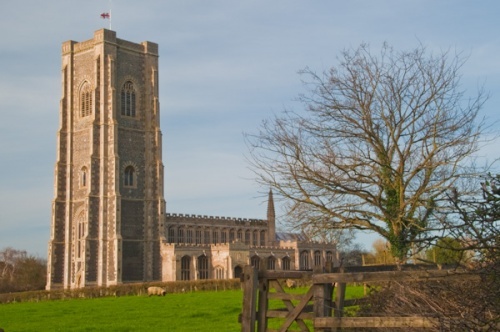 The major benefactors of Lavenham's church were John de Vere, the 13th Earl of Oxford and lord of Lavenham manor, and three generations of local merchants named Thomas Spring (generally known as Thomas Spring I, II, and III). 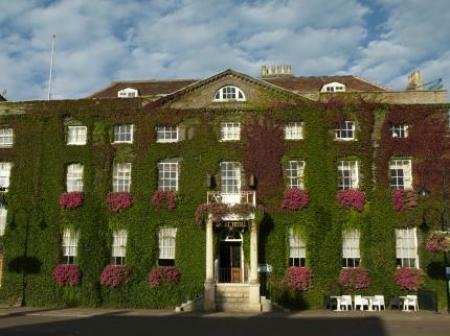 De Vere and the Springs were not shy about letting the world know their contributions, either; look up at the striking tower and you will see the star emblem of the De Vere family on every face. The Spring coat of arms is even more visible; it appears 32 times on the parapet. One story about the rebuilding of the church bears repeating - though goodness knows how much truth there is in it. According to this tale, John de Vere was one of the most influential followers of Henry, Earl of Richmond, in his struggle with Richard III. De Vere helped Richmond defeat the king at the Battle of Bosworth and take the throne as Henry VII, the first of the Tudors. 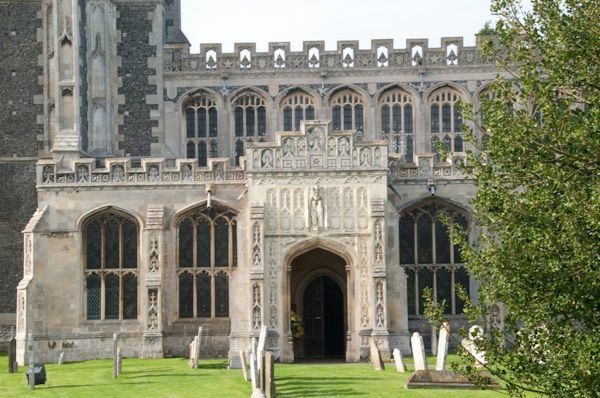 After the defeat of Richard III, de Vere suggested to the townsfolk of Lavenham that they might like to rebuild their old parish church in grand style to give thanks for the Tudor victory. The wealthy merchants agreed, and work began in 1486. So, do we owe this wonderful building to a town's gratitude for the victory of Henry VII at Bosworth? It seems a trifle unlikely, and a rather simplistic explanation, but it makes a good story. 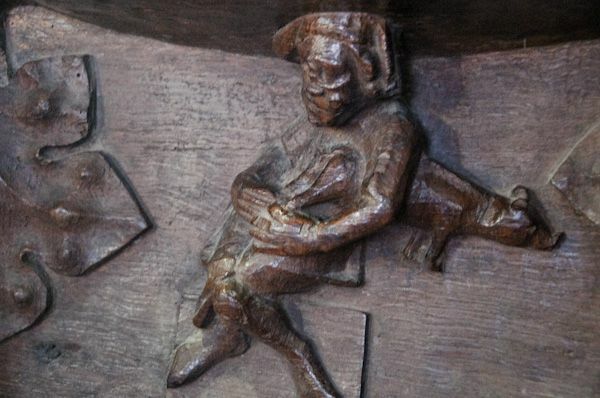 The man most likely responsible for implementing this grand vision in stone was John Wastell, whose work appears in many East Anglian churches, including St Edmundsbury Cathedral. Wastell left the chancel of the existing 14th-century church mostly intact, but the rest is a superb monument, and one of the best examples of late Perpendicular style in the country. 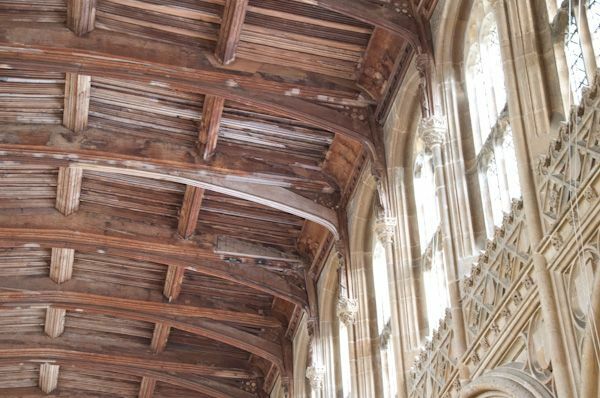 You enter by way of the south porch, richly decorated with fan vaulting and bearing the De Vere family arms. 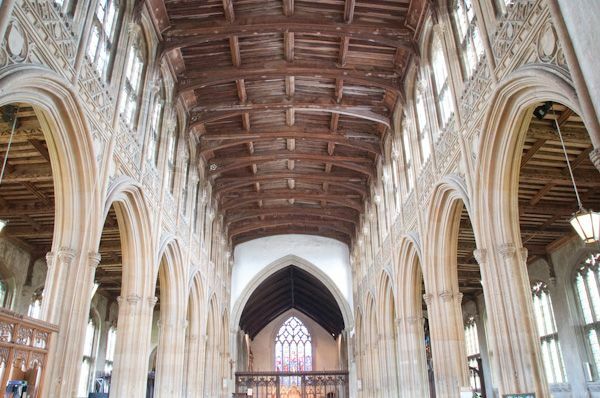 The long nave of 7 bays stretches over 150 feet and is 70 feet wide. It is lit by large Perpendicular windows and a sizeable clerestory which makes the interior seem spacious and light. There are separate chapels on either side of the chapel; to the north is the Branch Chapel (c. 1500) and to the south is the Spring [Sprynge] family chapel (c. 1525). 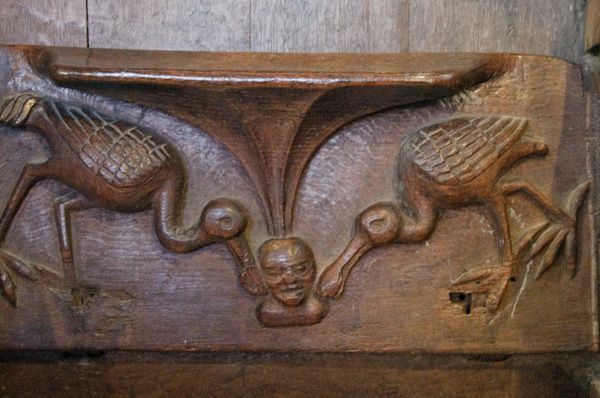 This latter screen is a superb example of Renaissance carving, probably executed by Flemish woodworkers. 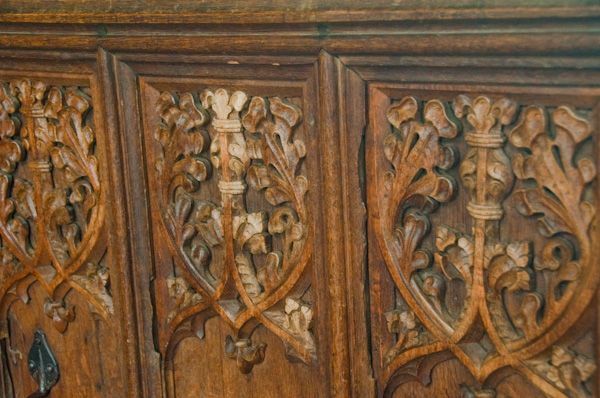 Among the numerous outstanding fittings is an early 14th century painted rood screen (c. 1330) and similar parclose screens fronting both the Branch and Spring chapels. 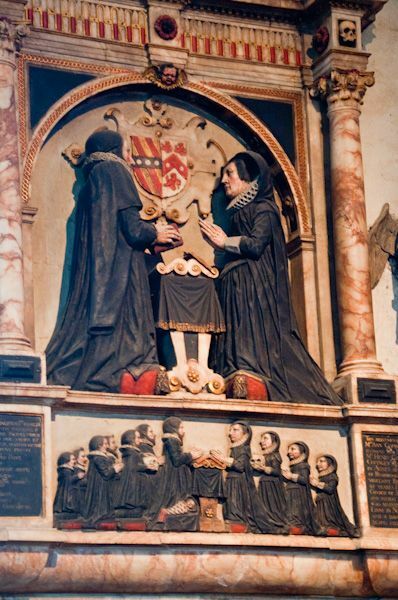 The Spourne parclose screen is wonderfully carved and protects the tomb of John Ponder (d. 1520). 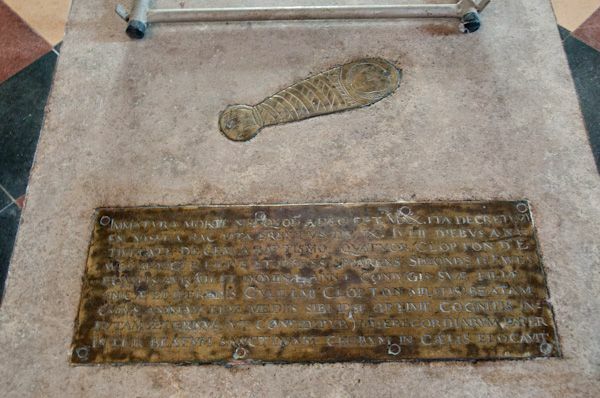 Funeral monuments range from the 15th-17th centuries, but the most touching is a small memorial brass to an infant, showing the child wrapped in blankets. 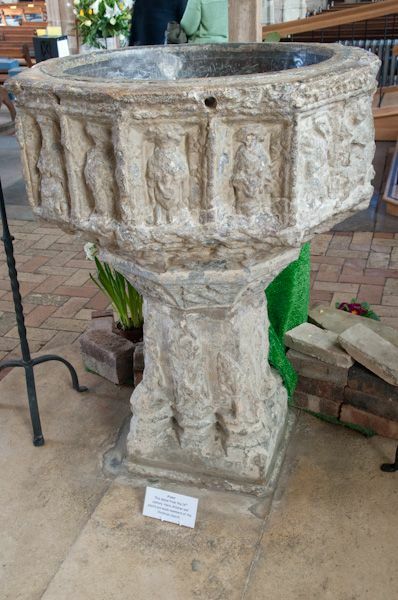 The octagonal font is 14th century but is much worn. 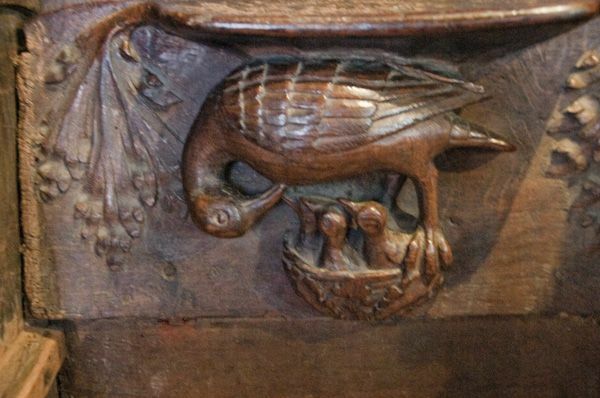 There are some fascinating misericords, one showing a pelican with her chicks, another depicting a man holding a pig. There is a ring of 8 bells, but one, in particular, is worth a mention. That is the great tenor bell, cast by Miles Graye of Colchester in 1625. According to the Lavenham Deanery guidebook, this bell has been described as 'the finest toned bell in England, probably in the world'. 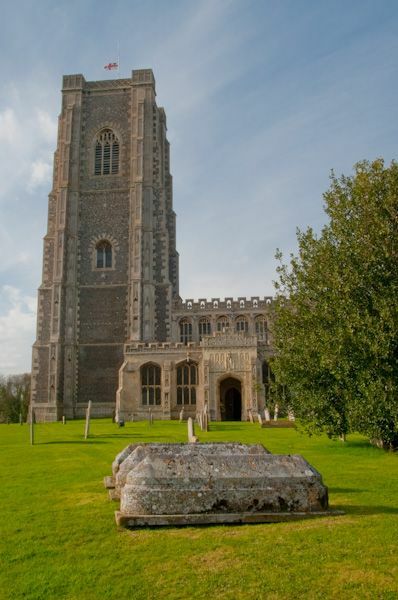 High praise indeed, and perhaps borne out when you consider that when a member of the royal family dies, the tenor bell of Lavenham is rung to mourn the death. In a town of magnificent medieval, Elizabethan, and Jacobean buildings, the church of St Peter and St Paul is perhaps the finest of them all, and to that praise not much more can be added. It is worth making a special trip to see this magnificent church. Location: On the A141 to the south of Water Street. There is a paid parking area very near the church, right on the main road.